Though a crow is a black bird, it's not a blackbird. Nor is a blackbird a crow. Both are members of the order Passeriformes, but of different families. The crow is Corvus brachyrynchos, of the family Corvidae and the blackbird is of the family Icteridae. There are several species of blackbirds in North America. Nearly everyone's familiar with the crow, as this intelligent bird is found throughout much of North America. You may have seen this large bird in a field, in the middle of your town square or sitting in a treetop, chattering away. He has a distinctive caw and is usually among other crows because he's a very social bird. The crow is the problem-solver of the bird world, able to call his friends around to ward off predators and is adept at picking through garbage for food. He also eats insects, carrion, fruit and baby chicks. He is a black bird -- his feathers, beak and legs are black -- though some species will have white or gray markings. The red-winged blackbird is a familiar bird throughout North America, particularly east of the Rocky Mountains. The male of this species sports bright red spots at his shoulders, as his name implies. The female isn't quite as colorful, and is a dark brown with a white eyebrow stripe, pale breast and orange-colored throat. Like the crow, this fellow is also quite social, spending time with his flock. You may spot this bird in marshes and other wet areas, as well as meadows and fields. Unlike the monogamous crow, the red-winged blackbird does not mate for life. This guy is found throughout North America, though where you spot him will depend on what time of year it is. He migrates around the continent, but is found year round in the western states. 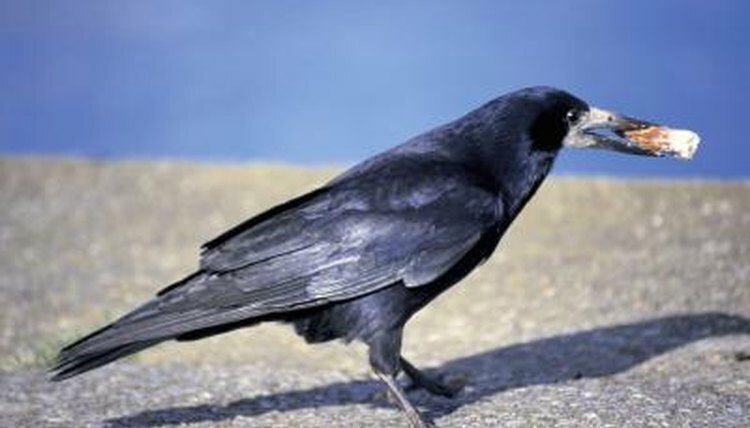 At first glance, you may confuse him with a crow because of his black coloring, however he takes on a glossy color, sporting a purplish-blue iridescent head. Brewer's blackbird is a ground forager, looking for insects and seeds, so you may spot him on the sidewalk or in shrubs. His habitat varies from meadows, woodlands, marshlands to city parks and streets, agricultural fields, lawns and golf courses. Like the crow, he's outgoing and enjoys the company of his flock. The male of this species is notable for his vibrant yellow head and chest contrasting with his black body; the lady of the species is brown with a yellow neck. His range varies according to season, as he migrates from northern areas southeast, eventually wintering in the Southwest and Mexico. The yellow-headed blackbird roosts in freshwater wetlands and forage for food in fields. His diet consists of insects, grains, seeds and aquatic invertebrates.